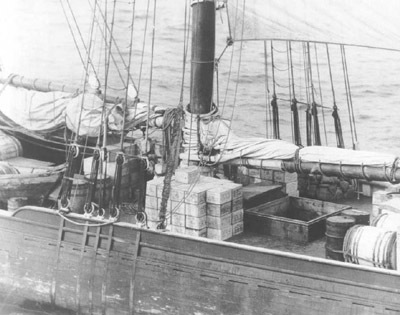 Jeremiah sent in a fascinating post by Nicola at edible geography about how Prohibition, which outlawed liquor in the U.S. from 1920-1933, changed our culture in a number of ways that aren’t immediately apparent. Nicola draws heavily on historian David Okrent’s book Last Call. These loopholes led to a dramatic rise in the popularity of wine in the U.S.: “American wine consumption increased from 70 million gallons in 1917 to 150 million gallons in 1925,” according to Nicola. That change affected the agriculture of California, in particular, where many acres of other crops were replaced with wine grapes. In another unexpected consequence, Okrent argues that the medicinal use loophole was a central factor in the success of drugstores such as Walgreen’s, since sales of alcohol for medical purposes were very profitable. …a floating ship-city, thousands of miles in length, bobbing up and down in place along the coast of America, and serviced by a fleet of much smaller, nimble rum runners that slipped to and from the mainland under cover of night. 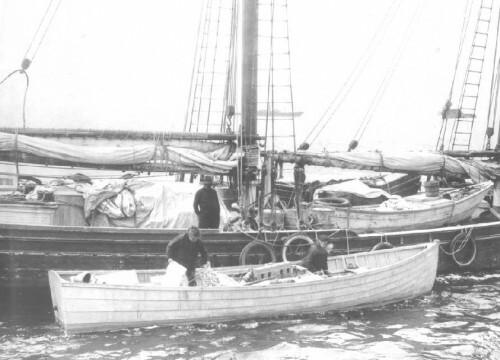 The U.S. government began to push for an extension of the area of the ocean over which governments have jurisdiction, from 3 miles to 12, which would make it much more difficult, time-consuming, and dangerous to run liquor in from the larger ships. The U.S. eventually succeeded in pushing its national borders outward, expanding national sovereignty over oceans, another unexpected consequence of our anti-alcohol policies. Rum Row dutifully relocated farther offshore. “People don’t realize,” Okrent told LIFE.com, “how much drinking there was in this country before Prohibition. We were awash in booze. In 1830, for example, the per capita consumption of alcohol was three times what it is today — 90 bottles of booze per year per person over the age of 15. By 1933, drinking was around 70 percent of pre-Prohibition levels, and with some fluctuations has stayed well below pre-Prohibition levels ever since. 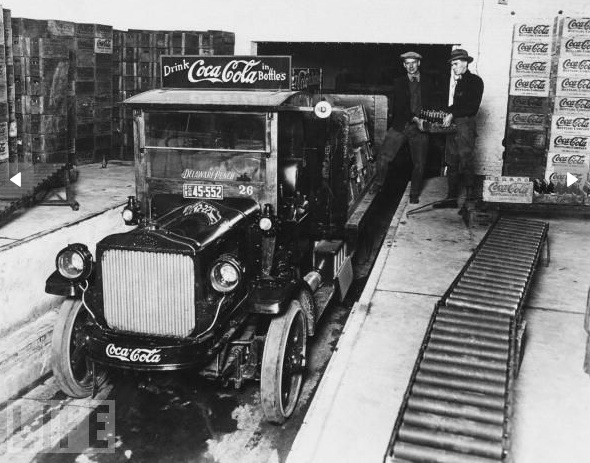 And if you buy Okert’s argument, Prohibition even gave us NASCAR; he says it emerged in the South after Prohibition ended, when all the former runners of liquor needed new uses for their driving skills and fast cars now that they could no longer make a profit smuggling booze. So there you have it: some of the unintended consequences of Prohibition, and example of the way public policy can have implications for areas of social life that seem far removed from the topic at hand. This actually ties in a bit w/your previous post -- the newspaper article stating that areas that were more dependent on the alcohol trade were more likely to be anti-women's suffrage. Prohibition was very much a female-driven movement, and much of the justification for it was framed in terms of domestic abuse: men were deemed to be much more likely to beat their wives when they were drunk. "100% grape juice. It is illegal to add three a half-pound of sugar and a knob of yeast to this juice. It is illegal to cork it and let it ferment for for two weeks..." -and so on. I'm really interested that overall alcohol consumption went (and stayed) down, at least somewhat. Would that mean that Prohibition "worked" a tiny bit? Another contribution of Prohibition was providing enough income to organized crime that it developed into Big Crime. 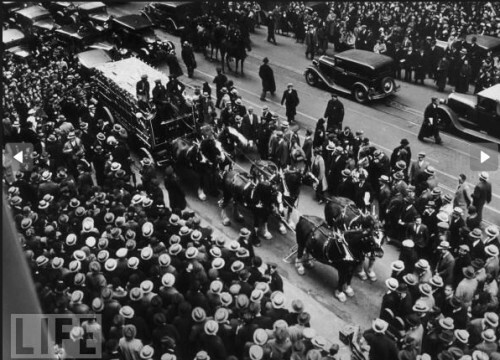 When Prohibition ended this money was invested in many other activities, some of them legal and some of them not. Don't forget how Prohibition directly affected places other than the US -- it was because of Prohibition that the Canadian government stepped in to regulate and control the production and sale of alcohol in Canada, since the profits from selling illegal booze to the US were so great that even the government decided that they wanted a piece! The Canadian government still controls the sale and distribution of alcohol in Canada today, and both the Ontario Control Board of Board and the BC Liquor Distribution Branch are two of the largest single purchasers of alcohol in the world. I grew up in a house that was originally built as a speakeasy. It had two fireplaces, a long, open front room, a section of shelves that could be taken out of a wall, and the top half of the wall would swing open to reveal a bar...the kitchen had a pass through window to the 'bar' area, and the kitchen door was one of those that opens separately on the top and bottom...and the garage was built out of cinder blocks and cement with huge swinging wooden doors...and the edge of the roof was lined with small turrets! 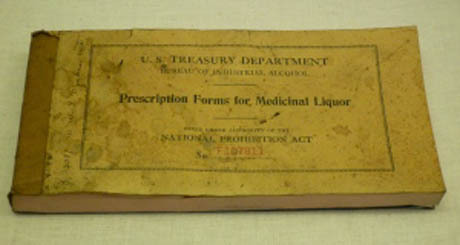 That "prescription booklet for medicinal alcohol" reminds me of how medical marijuana works in states where it is legal: people trumping up "legitimate" reasons for wanting something that is pleasurable. Re unknown consequences of laws on substances: I do know people who have recommendations (as the prescriptions for pot are called) for true medical reasons, but many of them get them via fabricated medical reasons so that they can smoke and obtain pot legally, since most dealers in California have either gone legal or gone out of business thanks to the proliferation of dispensaries. Now that street weed is almost an anachronism in California, many of the dispensaries oppose Prop 19, the proposition that would legalize pot for all, because it would lead to more competition. Billy Ray Cyrus narrates a history of Prohibition and NASCAR in the Appalachians. I don't know if I saw it on the History channel or PBS, but it was interesting. 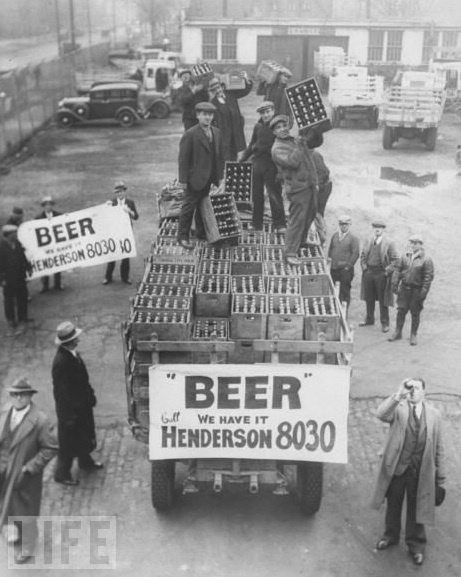 Prohibition killed off the hundreds of small, local breweries that florished in the early 20th century. 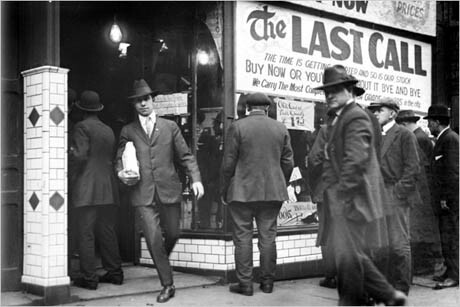 Larger outfits, like Budweiser, were able to survive by selling "near-beer", and after prohibition ended, they moved in quickly to replace the local producers. 50 years would pass before the microbrew revolution would bring back local, fresh, flavorful beer to America. No mention of the Mafia? "The little-told story of how the U.S. government poisoned alcohol during Prohibition with deadly consequences". Essentially, the US government added poisonous substances to industrial alcohol, knowing it would finds its way to the lips of the disadvantaged and poor. They knew this would happen, and that people would keep drinking it; alcoholism is a physical condition. You essentially had the government systematically poisoning the undesireables of society, with nary a word spoken. The other legal use of alcohol was for religious purposes, which probably accounts for some of the California wine-growing. RE: Religious use of alcohol being legal- My husband's grandfather's father deserted the family. The mother had 2 children to support. The rabbi in the Mass town where they lived gave her the "legal OK" to produce wine for their synagogue- knowing that she would also then bootleg it & be able to support her family. I hate to nitpick, but the author of "Last Call" is DANIEL Okrent, not David. Here's another unintended consequence, according to George Chaunce's "Gay New York: Gender, Urban Culture, and the Making of the Gay Male World, 1890-1940." (Terrific book.) In the 1920s, during Prohibition, there was a huge upsurge in New York's gay subculture, and it was a pretty easy place to live if you were gay. A lot of straight people thought it rather daring and wicked to have openly gay friends, and there were some flamboyantly queeny nightclub stars who were wildly popular with straight audiences, largely for the titillation factor of course. With Repeal coming, the anti-liquor forces were in retreat, but still powerful enough to make demands. One was that places that served alcohol could be fined or closed if they didn't see that their patrons were "of good character." One of the things that meant was, not homosexual. Many bars and restaurants, even cafeterias popular with gays, were harassed in the name of that phrase. And with the Depression and hard times coming, what many saw as the self-indulgence of the homo was frowned upon, and the culture became more straight laced. So to speak. Result: The gay subculture was driven underground, there to stay for decades. 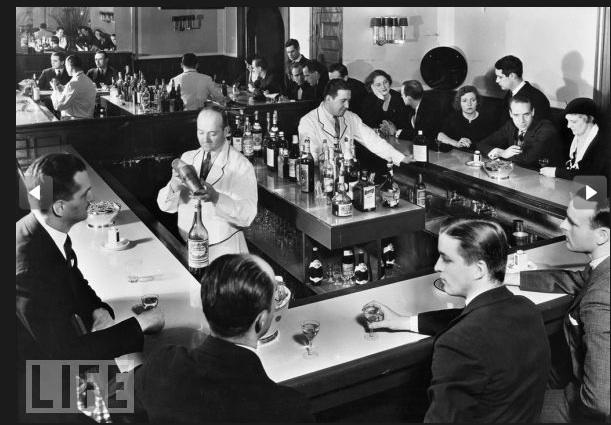 The Mob turned some of their speakeasies into gay bars, charging absurd prices for drinks and paying off cops to prevent raids. This didn't always work, as cops would stage raids anyway just to keep gays terrorized and in their place. This was effective, as a man caught up in a gay bar raid could lose everything: family, home, job, a future. But being underground changed gay culture, too, as generations of gays and lesbians learned how to live while hiding in plain sight. Many still do, unless they get caught. ("Oh, Senator Craig, call from Reverend Haggard on line one.") And the simmering anger at being unfairly oppressed led to the birth of the gay rights movement and modern gay culture. Camp, cruising techniques, code words, gaydar, drag queens, Fire Island, White Parties, Will & Grace, Brokeback Mountain ... ahh, my people, what we have built together. All these are products of modern gay culture and thus indirect results of the "of good character" clause. And they certainly were not what the anti-liquor guardians of moral rectitude intended. "We were awash in booze. In 1830, for example, the per capita consumption of alcohol was three times what it is today." True, and that probably was because most water was not potable. I think Okrent (Daniel, by the way, not David) is cherry picking his dates and that consumption dropped steeply after 1830 or so. @bagelsan. Prohibition did reduce alcohol consumption. Hospital admissions for alcohol related things went down. "Nicola draws heavily on historian David Okrent’s book Last Call." As several other commenters have noted, this has been incorrect now for four days. DANIEL Okrent is the author of Last Call, as well as the former public editor of The New York Times and managing editor of LIFE Magazine (where I had the pleasure of working for him, briefly).